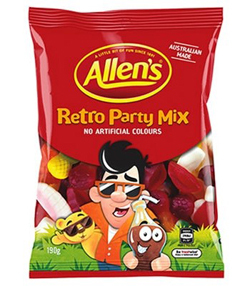 Create smiles for the whole family as you open a bag of Allen's Retro Party Mix. It's the perfect mix, with a favourite for everyone: teeth, pineapples, racing cars, strawberries & cream, milk bottles, raspberries, lips, honey bears, cola bottles and retro man. Glucose Syrup (Wheat or Corn), Cane Sugar, Thickener (Dextrin Roasted Starch, Acid treated Starch or Starch acetate) (Wheat), Gelatine, Food Acid (Citric), Colours (Titanium Dioxide, Carminic Acid, Copper Chlorophyllin, Turmeric, Paprika Oleoresin, Carotene, Vegetable Carbon), Flavours.